My Garments of Praise: WE DID IT! 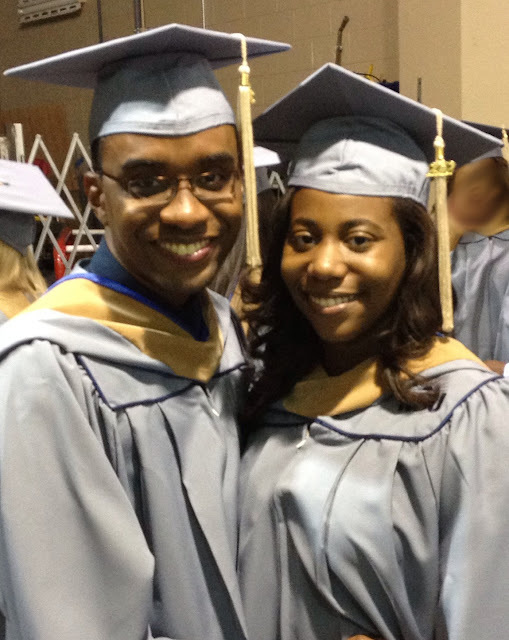 My husband Dwayne and I graduated with our Master's Degrees! It's been quite a journey, but I can't think of anyone in the world I would rather have taken it with. I've found that we've been an incredible support to each other, with the ultimate help of God, in so many ways over two years we've been married and the time we've spent studying. The journey hasn't been without ups and downs, but all things work together for good! Thank you, Dwayne, for being a great husband and an amazing friend! I love you! To our family and friends, near and far, who supported us and shared in our joy as we walked across the stage, we love and appreciate you all very much. With all our gratitude, thank you! P.S. - I'd like to congratulate my good friend Dani and her new husband J on getting married on Saturday in California! We wish we could've been two places at once, but we know they had a beautiful day and hope they have an even more beautiful life together. All the best! Congratulations. That is such a sweet blessing. I wish you and your husband all the best! What a beautiful post! Thanks for being such an amazing source of support! Amen. That is a true blessing! Congrats. I just got my BA this May so hopefully I work up to a Masters. Loving the blog very genuine. This is such a great encouragement... Thank you for your kind words of support! Thank you so much for the shout out!! Congrats to you and Dwayne on your accomplishment!! Love you both so very much and I hope to see you all soon!! Awwww.....LOVE!!! Proud of both of you....wait a second...could I change some grades still??? LOL!! !